LED Light Kit with key fob to adjust brightness of the strips. Includes 2 LED extension strips. Made to work with an 8-10' awning. Additional strips are available. SunWave LED light strip will last up to 3000 hours of continuous use and the LED light strips are water-proof. This is a multi-use product designed for easy installation under any awning, or cabinet, in any storage space, or to any steps or walking areas for additional light. The LED Light kit can be used as a night light on the inside or outside of your RV. With this multi-use product the possibilities are endless and energy efficient! Will last up to 30,000 hours! Usable in or outside your RV! This is a Perfit PERFECT GLOW 12' LED IP68 Full Waterproof RV Awning light kit w/ PC Mounting Channel for Permanent Installation. Like all of the products we sell they are used by the OEM's and installed on brand new units everyday so they are tried and true... This kit is specifically designed for recreational vehicles, do not be fooled by the other sellers that sell the IP65 Crystal Resin "Waterproof" LED strip light with 3M. We have been down this path, it will not hold up to the elements. The OEM's are using this Full Waterproof IP68 w/ Mounting channel in production units. This strip is covered in Crystal Resin like the IP65 but it's also encased in another Silicone sleeve, this gives you double the protection from the elements. Then this LED strip is installed in the UV treated Polycarbonate mounting track/channel (The strip is held in place by it's adhesive backing and compression by the channel) which is made right here in Elkhart, IN. w/ real commercial grade 3M adhesive tape. 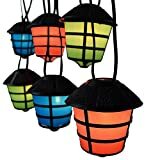 FEATURES: Indoor/Outdoor 12' Cord 24" Spacing Between Lights 10 Light Covers including (4)blue,(3) green and (3) pink End-to-End Connection About 5" H UL Listed Easy Assembly - just snap on covers and plug in! ---------------------------------- One-of-a-Kind Retro RV Lanterns The popular RV lights are back! Bring back the fun retro RV lantern look that everyone knows and loves. 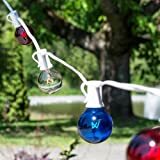 Hang these from an awning, your camper, RV gutters, etc! 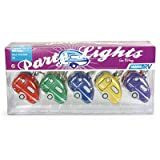 If you're looking for some party lights, or some outdoor lighting decorations. With this cost-effective led solar string lights, it costs you nothing to run. 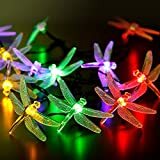 The dragonfly shape cover makes it beautiful and fairy at night on trees or anywhere outdoor. Besides, your kids would love them! How the Flash 8 Modes Work? 1. Flashing from Mode 2 to Mode 7 at random. 2. Waving from bright to dim repeatedly at two speeds. 3. Flashing alternately and sequential in 4 speeds. 4. Every single light fade slowly from bright repeatedly at 3 speeds. 5. Starry flashing with lighting in wave. 6. All lights flashing in the meantime. 2. Press the Power ON button, but only if the solar panel is close to dark, the lights would be on automatically. 3. The lights would turn off automatically when the solar panel surface is facing any light. 4. It's waterproof, turn it on, use it outdoor, sunlight gets it recharged at daytime, and it's on at night. 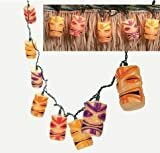 Great set of tiki face lights, perfect for the patio, lounge or tiki bar! Includes ten 3" plastic lights on a 7 1/2 ft. strand. UL-listed. Light sets interconnect. LED Light Kit with key fob to adjust brightness of the strips. Includes 5 LED extension strips. Made to work with an 18'-21' awning. Additional strips are available. SunWave LED light strip will last up to 3000 hours of continuous use and the LED light strips are water-proof. This is a multi-use product designed for easy installation under any awning, or cabinet, in any storage space, or to any steps or walking areas for additional light. The LED Light kit can be used as a night light on the inside or outside of your RV. With this multi-use product the possibilities are endless and energy efficient! Usable Inside or Outside your RV!